Virtual reality (VR) is a technology aimed at creating an immersive computer-generated experience for the user through special software and wearable devices (goggles). VR replaces a user’s entire surroundings with a complete simulated 3D setting, appealing to eyesight and hearing. Basically, VR is like a time machine: one moment you’re in your room in 2018 putting on a VR headset, and the next thing you know, you’re flying over snow covered mountains in a WW2 fighter, enjoying 360 degree views or doing aerobatics. Even more exciting is that VR technology is interactive, and users’ actions allow them to interact with the surrounding environment to certain extent. How Is Virtual Reality Growing? Some virtual reality sets come with handheld devices that are used for interaction and movement within the simulation. All VR systems require a wearable headset and a device capable of running specialized software that delivers a VR experience. These can be PCs (gaming-grade due to the high requirements of VR technology), highest-quality smartphones or VR-ready gaming consoles like Sony Playstation VR. Higher-end VR sets like HTC Vive or Oculus Rift require a PC, but there are cheaper alternatives like Samsung Gear or Google Cardboard that require only a mobile device. The latter deliver less immersive experiences due to some limitations. Despite the poorer performance, the accessibility of these cheaper mobile VR options is paying off. By February 2017, Google had sold 10 million cardboard headsets, with Samsung occupying the second place with 5 million devices. In Q3 2017, VR headsets total sales topped 1 million for the first time. According to the IDC, in 2018 the shipment volume for VR/AR devices is expected to reach 12.4 million units with a year-over-year increase of 48.5% as more new vendors and use cases emerge. In a long term prospective, the IDC predicts growth to 68.9 million units in 2022 with a five-year compound growth rate of 52.5%. The forecast also mentions a gradual increase of standalone (wireless) and tethered VR headsets over mobile. According to a report by Grand View Research Inc, the VR market is expected to reach $48.5 billion by 2025. As the market grows, we will see more developers focusing on VR software like VR engines, Software Developments Kits (SDKs), and applications for e-commerce, healthcare, real estate, and entertainment. Developers and creators catering to VR are already experimenting with their content monetization methods, like in-app purchases, subscriptions, and of course, advertising. Unsurprisingly and to the delight of marketers, the VR market is following in the steps of desktop and mobile with VR providing a whole new level of engagement with immersive and 360 VR video ad experiences. The growing number of VR users suggests that within a few years, it will become the next big channel of brand communication with audiences. VR headset vendors have already initiated work on monetization tools for developers who create apps. HTC introduced a VR Ad Service for their VIVE platform in 2017. The service allows VR game developers to monetize their gaming apps with integrated ads of various formats on an opt-in basis. HTC also introduced eye-tracking technology to verify that users actually did view the ad—a functionality that will likely spur advertiser confidence since ad viewability issues are among the major ad tech challenges, especially for advertisers. Infectious Media and quoted statistics by Comscore, report that 54% of ad impressions go unseen by the users, effectively draining advertising budgets. Eye-tracking tech can significantly improve effectiveness of advertising for marketers. After a setback in growth during 2016, the VR market recovered throughout 2017 and is expected to make a full comeback in 2018. In fact, during the Mobile World Congress 2018, more hardware vendors including Lenovo introduced their own products. Tech giants already in the market offered both functionality improvements (standalone untethered headsets, wireless PC-enabled headsets, higher display resolution and positioning tracking) and showcased new usage scenarios beyond entertainment, marking the arrival of the second generation of VR devices. For instance, Volkswagen Group and the VR studio Innoactive collaborated to create a VR simulation to train 10,000 employees working for different brands within the group. One of the training simulations created by Innoactive and optimized for HTC Vive Pro was shown at MWC 2018. Gradual usability improvement and a decrease in hardware price will inevitably boost VR adoption by the audience. 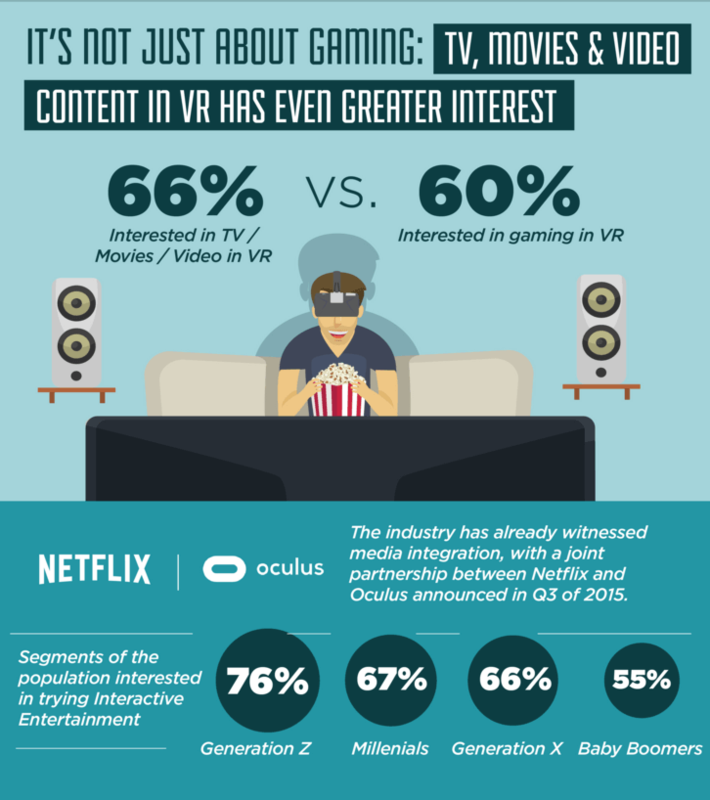 Tellingly, 55% of baby boomers are interested in VR video and entertainment. Among more tech-savvy audience segments like millennials and Generation Z, the numbers are even higher—67% and 76% respectively, much to delight of marketers, fighting for their attention. In fact, VR arrives at the right time to revive digital marketing and save users from the advertising fatigue induced by existing ad tech practices. As mentioned earlier, there is a viewability problem that haunts traditional ad tech, but it isn’t the only ghost stirring up problems. If we take a look at the state of advertising from the user’s perspective, a number of “traditional” desktop and mobile ad formats like pop-ups, flash banners, and interstitial ads are overly aggressive and cause significant frustration for users. Intrusiveness is also a problem when it comes to video advertising. While marketers praise its efficiency, autoplay or unskippable video ads with sound often backfire, leading to negative sentiment towards the brand long-term. Previously, we’ve discussed the increasing role of programmatic advertising—a highly automated process that harnesses the power of big data and machine learning to run massive advertising campaigns. It relies heavily on user segmentation and predictive behavioral targeting based on user data. Brands leverage programmatic technology to reach vast audiences at different steps of the purchase cycle. At first glance, it seems like the perfect fit for personalized brand-consumer communication, but customers are growing weary of ubiquitous ads finding them across the web, and many consumers feel like their privacy is being violated. Furthermore, massive reach is not without drawbacks since brands can’t control their ad placements, resulting in brand safety risks when ads are displayed next to dubious or offensive content, like in the case of YouTube. Meanwhile, the effectiveness of common ad types is low with almost no change within the long term. Display ads are only clicked by 0.16% of users worldwide and 0.06% of users in US, according to Dr. Augustine Fou. Over the years, consumers have become less responsive to advertising despite the advances in targeting and personalization. Websites have been gradually increasing the number of ad placements, while marketers choose the easy path to attract users’ attention by introducing more aggressive ad types. Moreover, manipulative wording and misleading claims by brands from almost every niche have contributed to growing distrust among the consumers. Online advertising has become toxic, so instead of cutting through the ad-cluttered websites, users have turned to ad blocking as the means of improving their web experience. It is also a statement for marketers, showing that brands need to make a radical change in how they approach their target audience. It’s increasingly clear that the old school “ad bombardment” technique isn’t going to help advertisers to build relationship with customers. Can Marketers Redeem Themselves with VR? The new paradigm requires brands to create meaningful high-quality content which is relatable and provides real value, not just mindless slogans. The spending power of Millennials (biggest generation in history) and Generation Z is growing, but they are looking for more than just good deals—they want to buy from companies whose values resonate with their own. They are often called “digital natives,” and for a reason. They have been born and raised in times of digital revolution and for them tech is essential and embedded in most of their daily activities, be it working out, shopping, or passing time. In our article on advertising trends in 2018, we outlined that millennials cherish “commutainment,” communication via entertainment that occurs on social networks, messaging, and video streaming apps through sharing life moments and experiences. The tendencies of Millenials and Gen Z can no longer be ignored by marketers—particularly as these demographics’ buying power matures. Shah mentioned that demand for both ad types is increasing by 50% month-over-month and the trend is expected to continue in 2018, with 360 Ads being the mainstream ad format on VR ad networks and studios. Interestingly, in a recent poll by Vibrant media, 40% of users responded that they’re less likely to use an ad blocker against VR ads. There is no doubt that virtual reality creatives will continue to evolve beyond 360 Ads along with capabilities of headsets. New ad types will emerge. Users will be less constrained by limitations within environment. They will live through even more immersive scenarios and experience more memorable emotions. As we move towards social VR and user-generated content, brands may join the existing conversation and use the opportunity to establish connection with the audience, hear feedback about the product, etc. VR is yet to be adopted by the brands as part of their marketing strategy. According to Yes Lifecycle Marketing’s report, only 8% of surveyed marketers used VR in 2017. High cost of production—according to a Forrester Report, citing Ogilvy Innovation Director, Dayoán Daumont, the creation of a high quality VR experience may cost $500,000 for content creation alone. 360 VR ads would cost between $10,000 and $100,000. Inevitably, more brands will tap into the virtual reality space, following the growing number of VR device owners, increasing their exposure to ad experiences, optimized for various devices. While VR content is engaging, it still may be distracting due to high frequency of interruptions by 3D or 2D ad elements. The ad type is also important for users’ comfort, so if a certain VR ad isn’t letting users actually use the VR app they’re on—too large, hard-to-close, or too long—it’s not going to earn extra points for an advertiser. Given that VR is a closed experience and users aren’t able to multitask or move around in physical space, increased interruptions may ruin the quality time they allocated for using headset. User experience depends on ad delivery and advertisers should be just as creative as they are when it comes to manufacturing the content. However, chances are high that virtual reality market will follow in the same direction as mobile, where some of the most annoying ad formats and in-app ads flourish. Users are going to resort to ad blocking once again in order to enjoy uninterrupted VR, and we at StopAd are ready to provide them with required tool. Virtual reality offers new frontier for digital advertising. Nice one. Thanks for sharing. Keep it up. Next PostNext What is Two-Factor Authentication and How Can I Use It?